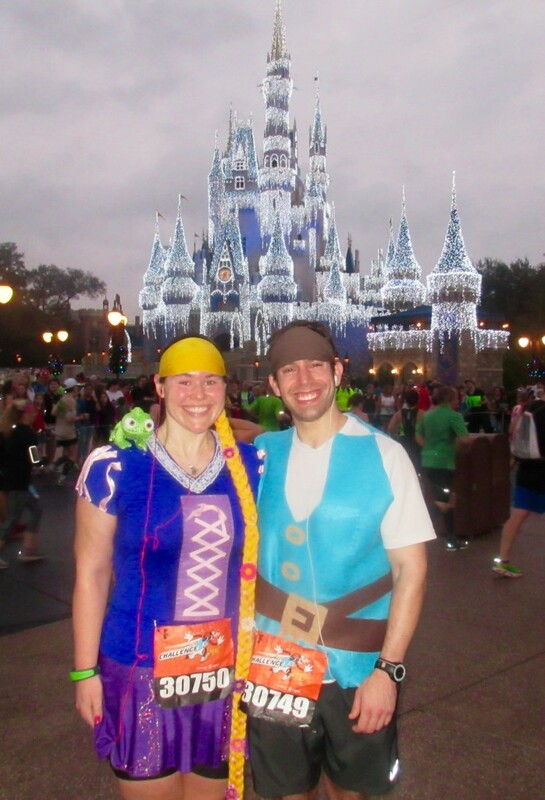 Okay, guys…I’m FINALLY back with my recap of the Walt Disney World Marathon! After the previous morning’s traffic fiasco on our way to the half marathon, we set our alarms for even earlier (ugh) just in case of a repeat performance. 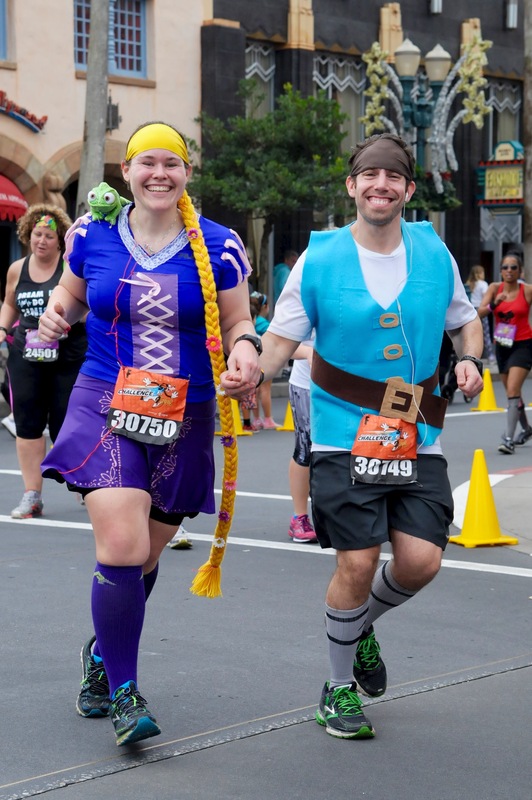 After getting dressed in our Rapunzel/Flynn costumes and doing some last minute safety pinning (to make sure certain chameleons stayed put for 26.2 miles, lol), we were out the door…and ready to sit in another hour of traffic. That morning took us even longer to get to Epcot, and if we hadn’t left by 4am we could have missed the start of the race. So, once again, we made it to the corrals with just moments to spare, and before I knew it we were about to begin another 26.2 mile journey. The temperatures that morning definitely felt warmer, and yet maybe slightly less humid (thank god). 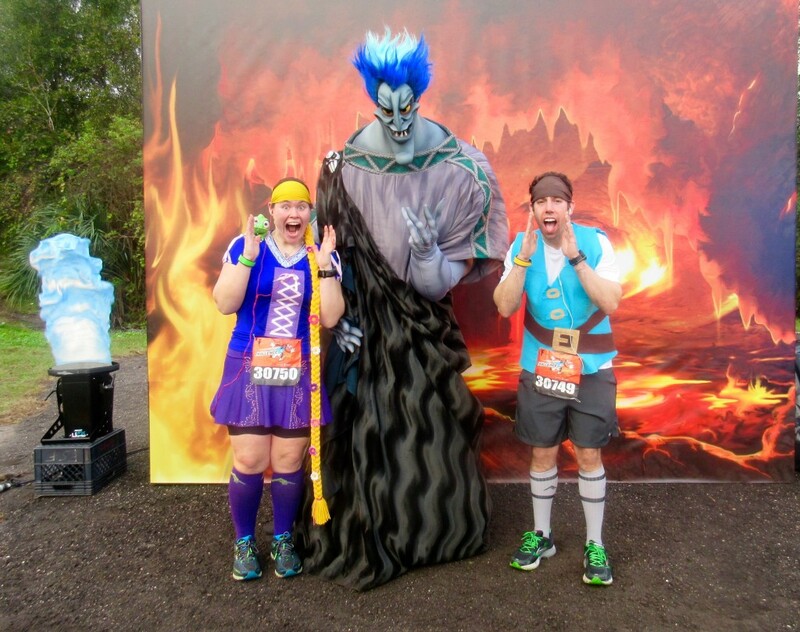 It was definitely wayyyy too hot for running a marathon, but I was in Disney…so, you know, whatevs. Our early miles were pretty much an exact replica the previous morning. Running in the dark. Forcing ourselves to keep our pace slow and steady to conserve energy for later. And sweating our asses off. We skipped the characters who appeared before the Magic Kingdom because they were either repeats or characters we didn’t especially care about (I’m still not into The Nightmare Before Christmas). 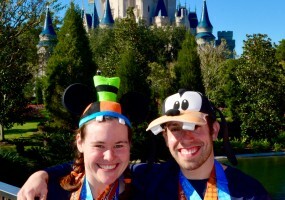 By the time we reached the TTC, we both had to make a pit stop, and we were soon continuing on to the Magic Kingdom: THE BEST PART OF ANY RACE, ANYWHERE, IN THE WHOLE ENTIRE WORLD. Running down Main Street was AMAZING as always, and that morning was even better because we weren’t running through a cloud of fog. We could actually, you know, see the castle. 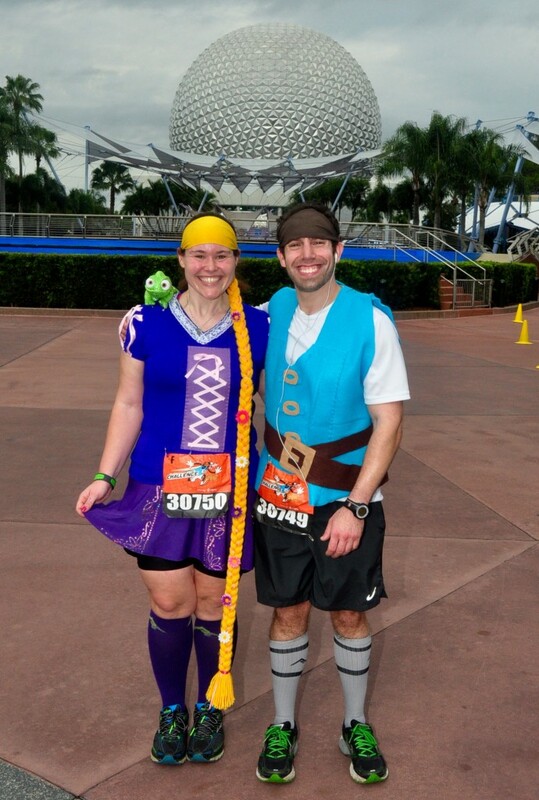 And, as a bonus…we were getting LOTS of attention for our costumes. You know what’s even more glorious than running down Main Street? Running down Main Street when the castle is still all lit up for Christmas. 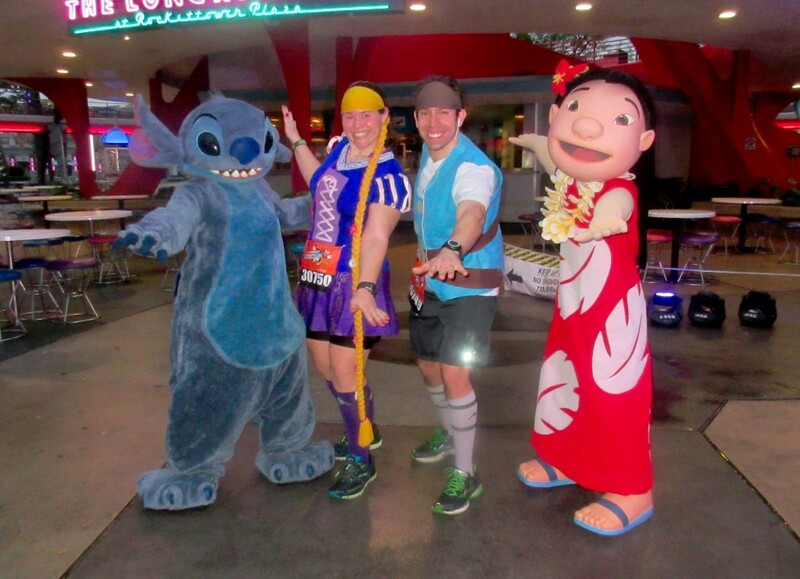 Our first character stop that morning was for Lilo & Stitch. Because, I mean, c’mon. It’s Stitch. And I loves him. 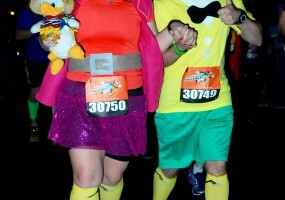 And then began the most magical part of the marathon. The reason I wish I could run this race every single year for the rest of my life. 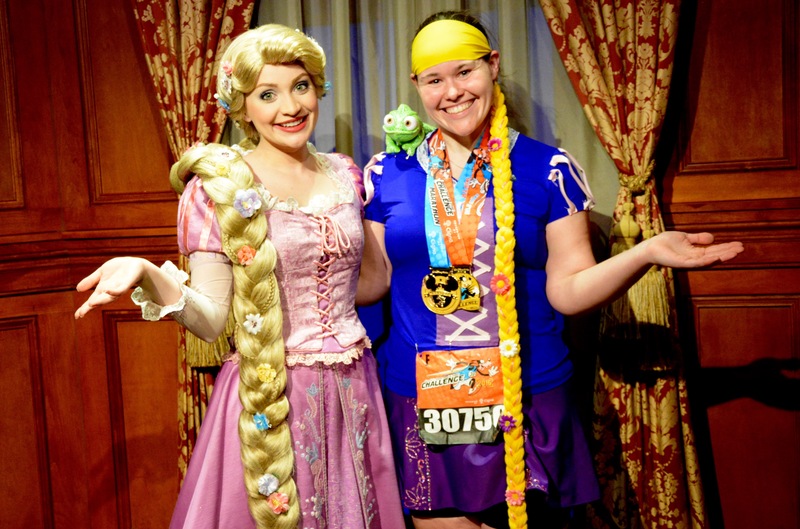 There are no words to describe the elation of running through the Magic Kingdom. If you took the “high” of crossing the finish line of every single race I’ve ever completed and added them all together, it still wouldn’t compare to how I feel when running these 1-2 miles through the park. Call me a dork, but…it’s the truth. And this year was THE BEST YET because, unbeknownst to me, the course had been changed quite a bit (due to the closure of the speedway, I presume). Suddenly I found myself running by Splash Mountain and through new Fantasyland and spending way more time in the park than ever before. It was AWESOME. And there were some amazing characters out along the way, including my favorite princess ever. When we jumped in line, Sebastian was posing with Ariel and I was SOOOO EXCITED. 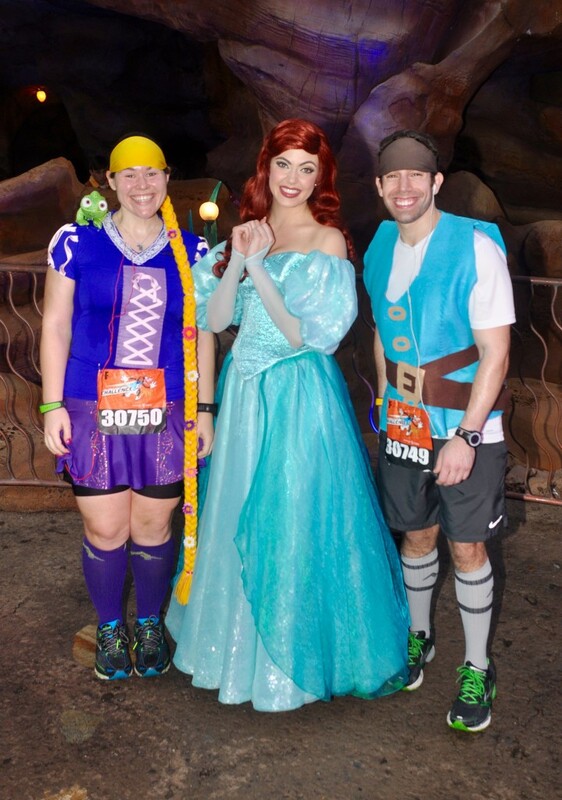 But, of course, he was escorted away by a cast member when there were just a few runners in front of us. Boo. 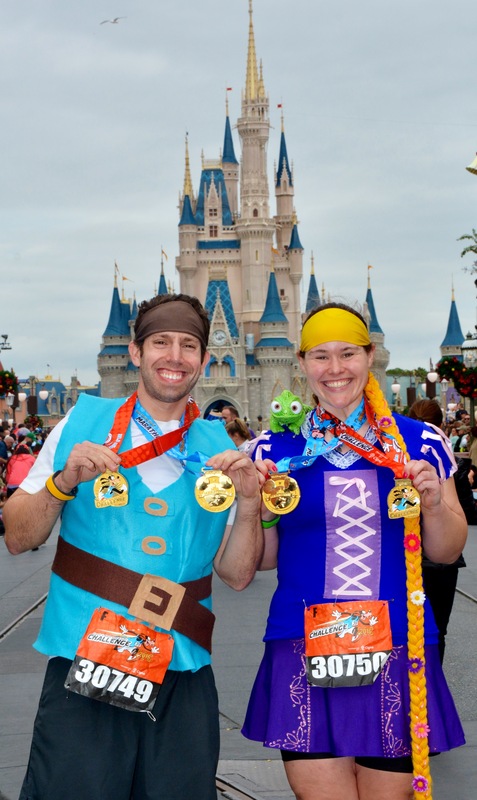 I wish we could run all 26.2 miles through Magic Kingdom. Not even lying. Before I knew it, it was time to exit via the backstage area and start making our way over to Animal Kingdom. This stretch of the course isn’t especially exciting. I was still feeling just fine, but Todd had been complaining of some tummy issues so I was hoping he would start feeling better. 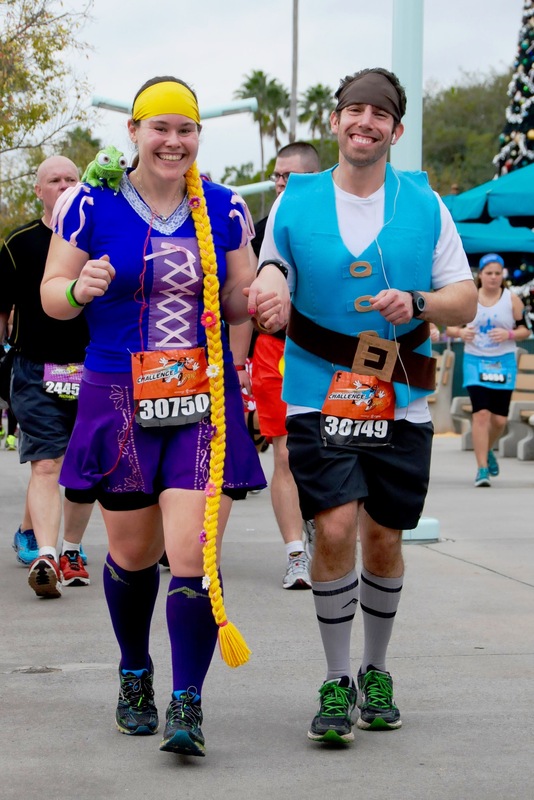 Obviously, the good part about starting in an earlier corral for a Disney race is the comfort of knowing that you can stand in line for some characters and take pit stops as needed…and little did I know then just how much we were going to need that extra cushion (spoiler alert). 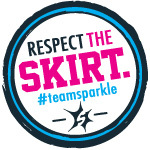 I was feeling especially grateful that I damn near killed myself to score an almost-PR at The Love Run last spring to submit for corral placement for this race. Character lines hadn’t been TOO outrageous at that point, but we did stop for a TON due to the extra time in Magic Kingdom, and of course we spent time taking pictures in front of the castle — which is why those 1-2 miles in the park always take us AT LEAST 30-45 minutes, if not more. Our pace was muuuuch slower than our usual race pace, of course, but we were still generally running around an 11:30/mile, if memory serves. So I wasn’t too worried at that point. When we leave the park, we tend to get stuck behind a cluster of walkers on narrow paths before the course opens up (a little bit) again closer to the golf course. We just did the best we could. It’s not like we were trying to PR or anything (obviously), but we did try to weave around other runners whenever possible and if the course got too congested we’d walk a bit until we could find an opening. And, fortunately, we found this guy and jumped in line right before he was supposed to switch for Donald. Lucky day. The stretch leading up to Animal Kingdom had some surprises for us this year. It seemed every half-mile or so had a different character…and they were all really RARE characters, with lots of VILLAINS! Never knowing what character you might spot up ahead is a GREAT way to keep your mind off the agony of, you know, running a marathon. I thought it was pretty much the coolest thing ever, so we jumped in line for pretty much all of them. Couldn’t help myself. They also had some animals out for us as we got closer to the park. Seeing this guy was pretty much my favorite part of the entire day, not gonna lie, lol. 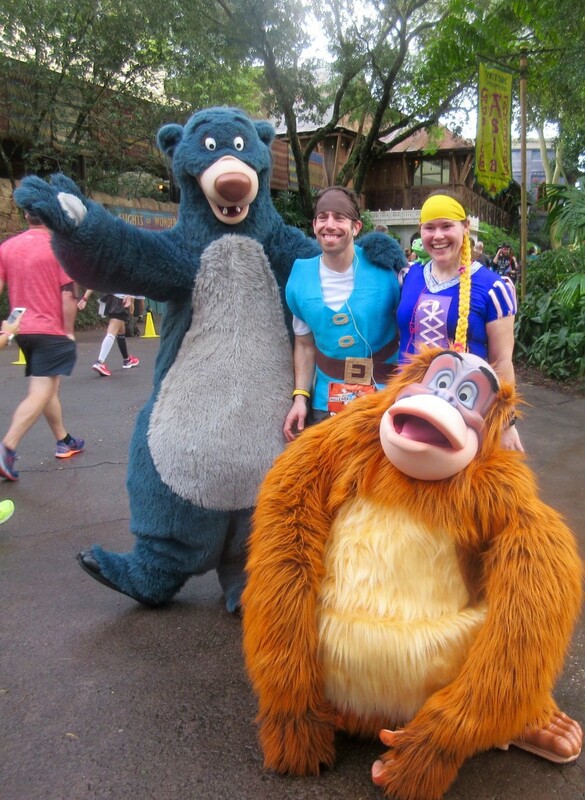 We made our way to Animal Kingdom for a short stretch of course inside the park. It was time for another potty break and some more silliness. Todd still wasn’t feeling quite right, and truth be told my stomach wasn’t 100 percent either, but that tends to happen when I’m a.) running in the heat and b.) when I’m traveling and haven’t been sticking entirely to my “normal” food. 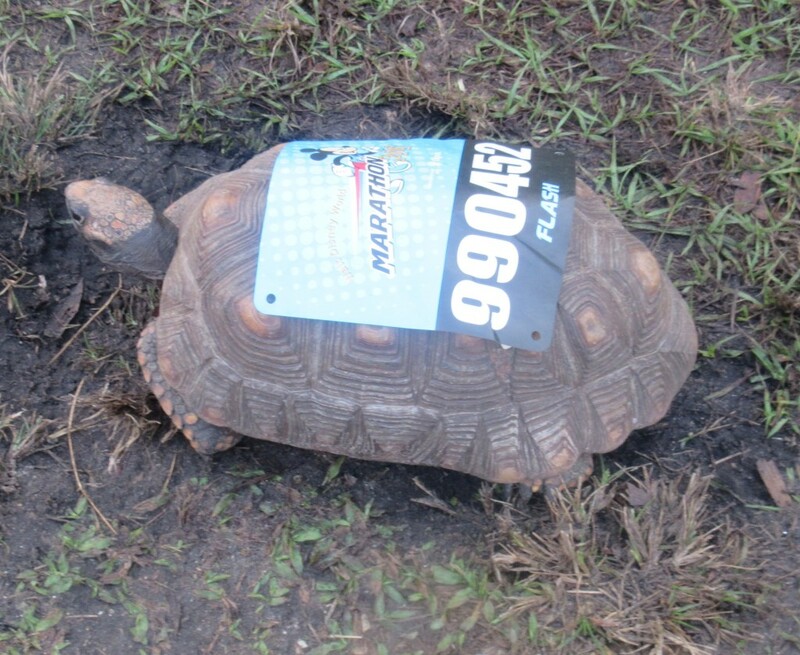 The Animal Kingdom part of the course is over sooo fast, and I knew the next several miles might be a bit of a struggle. 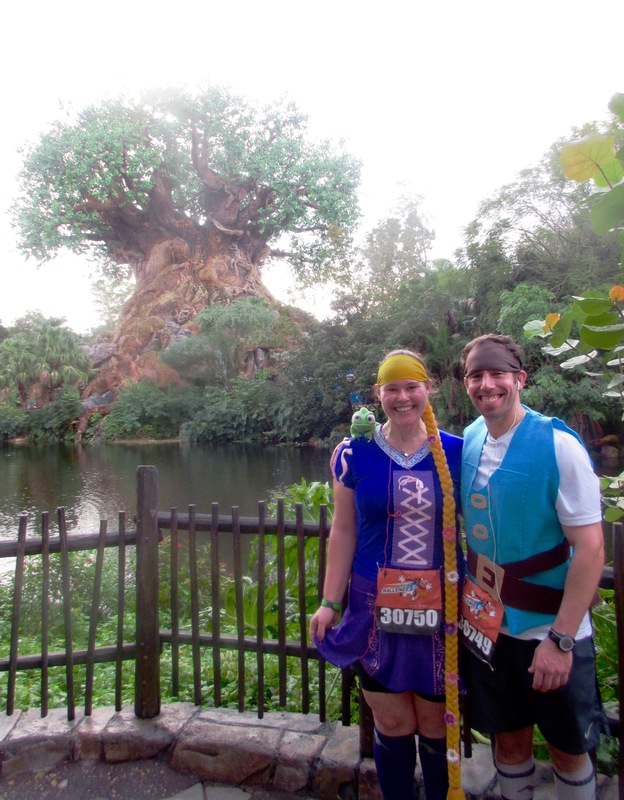 So I enjoyed our time in the park as much as possible…especially when another runDisney photographer grabbed us to pose us for pictures in front of the tree. Before I knew it we were back on highway, it was warming up…and things got a little boring. 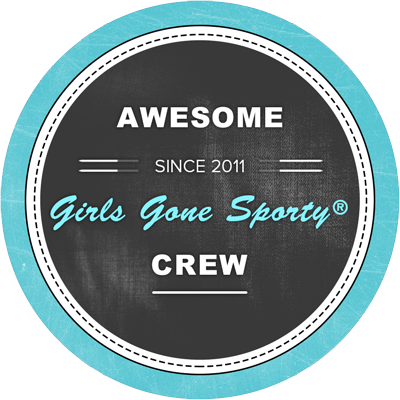 Especially since I know we were headed to the Wide World of Sports, and that’s just not a highlight of the course for me. This is probably where things started to take a turn for the worse for Todd. Now it wasn’t only his stomach, but his feet were starting to hurt big time and I knew the previous morning’s half marathon (and all the walking we did around the parks) was catching up with him. 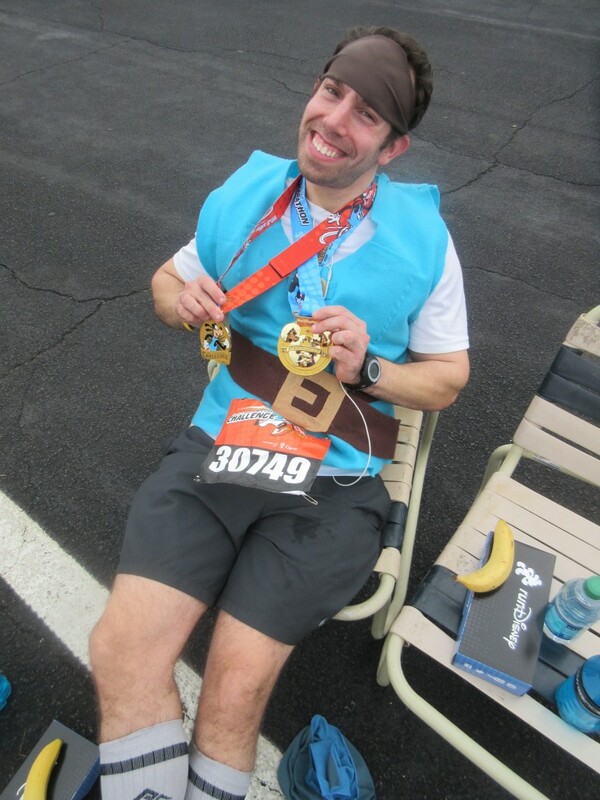 I’m used to tackling back-to-back races so I guess I knew what to expect, and I worried this might happen to him because it was his very first time with any sort of multiple-day race challenge. So it seemed only appropriate that this was our next photo stop, lol. We kept plugging away, but I could tell our walk breaks through water stops were getting longer and longer, and as we approached Wide World of Sports and Todd kept asking to take impromptu walk breaks, I knew we might be in a little bit of trouble. Unfortunately, we both remembered that it was right around this point last year when Todd lost his mojo, and this time we had the added fatigue of running the Goofy Challenge thrown into the mix. 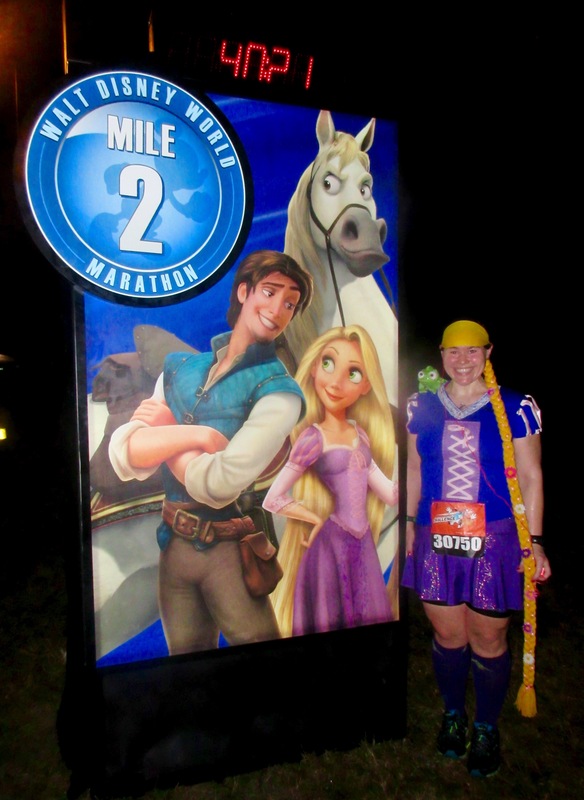 I was feeling perfectly fine at that point; a little bit of fatigue in my legs and feet, obviously — and I still don’t do well in the heat, pace-wise — but when I’m in Disney I just don’t feel pain. It sounds ridiculous but it’s so true. So I tried to do my best to keep him in good spirits. We ran/walked through Wide World of Sports. I was encouraging Todd to conserve his energy as best he could, and unfortunately all of our tomfoolery earlier in the race had caught up with us. Though we started in corral F we had fallen wayyyyy behind the runners with similar running paces, so we were getting trapped behind walls of walkers. Because there’s really just no room to run on the narrow paths at Wide World of Sports, we opted to just walk whenever it became impossible to weave around other runners. Todd said his legs/feet felt a little better after each walk break, so that’s what we did. And, you know, we rested our legs standing in line for pictures. 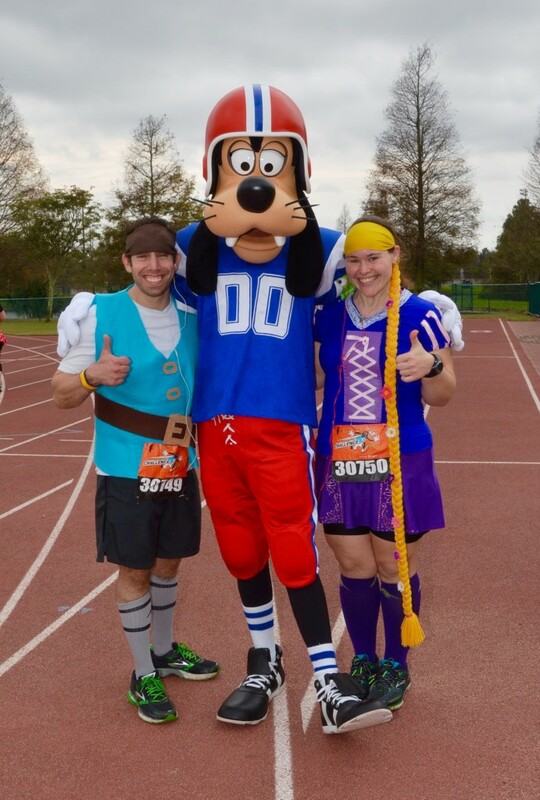 How do you NOT stop for a photo with Goofy when you’re *thisclose* to completing the Goofy Challenge?! Wide World of Sports felt like it went on forever, but we did pick it up a little bit for our victory lap through the stadium. After we left the complex we kept plodding along towards Hollywood Studios. It sort of felt like we were moving in slow motion at that point. Because this section of the course is something of an out-and-back, we could see that there were no other runners headed into Wide World of Sports…which I knew meant we had fallen a bit further back than I thought. I knew we had a little ways to go before the glorious Hollywood Studios/Boardwalk/Epcot portion of the race, and let’s just say Todd wasn’t in the best of spirits. His feet were killing him and his stomach was still upset. Since he has talked me down off the proverbial ledge many, MANY times in races before, I made it my mission to help him get to that finish line! We continued with our run/walk and made our way sllllllowly towards the final stretch of the race: the last 10K. 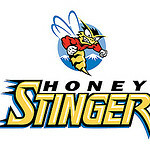 And let me tell you I have NEVER seen a swarm of people all start sprinting at the EXACT. SAME. TIME. I knew well enough that we would be “safe” once we entered Hollywood Studios in mile 22, so I knew that we were fine. But Todd and I tried to pick up the pace nonetheless! We’ve never been that far back before, and it wasn’t the most pleasant of experiences to know that the “dreaded” balloon ladies were now chasing us to the finish line! 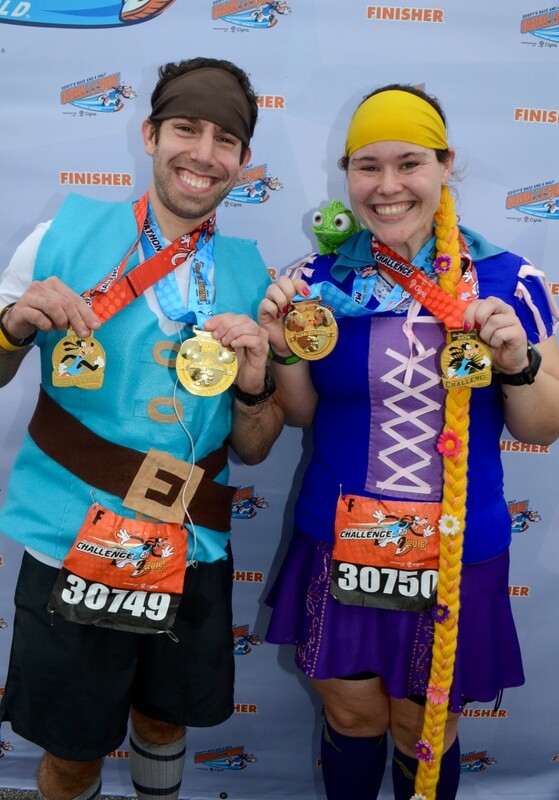 We made it into the park and runners were cheering and high-fiving and cast members were congratulating us on the way in, but since I’m such an experienced marathoner now (ha), I knew very well that these last couple of miles were still going to be pretty brutal. Even with all the distractions along the way. I was thrilled to take on this final leg of the marathon because there’s so much park time and you get to run along the Boardwalk, but Todd was not having ANY of it. I knew he was hurting and I let him dictate whenever it was time for us to take another break. The man still manages to smile for the camera, though…gotta love him, lol. And what better way to take a break than standing in line for more pictures? I have to say, I LOVED all of the “rare” characters this year. I think his spirits lifted a little bit in the park because Hollywood Studios was already open for the day and thus there were lots of cheering spectators (as well as disgruntled park goers who made it clear they were pissed at us for clogging up all the walkways, haha). My blogger friend Kim from Barking Mad About Running spotted us on our way out of the park, so it was awesome to have the personalized cheers. The path leading up to the Boardwalk is basically a disaster because it’s damn near impossible to run. Everybody and their mother was walking, and because it’s so narrow you really can’t go ANYWHERE. Todd’s legs had basically fallen apart by then, anyway, so it was fine by both of us if we had to walk a little bit more. 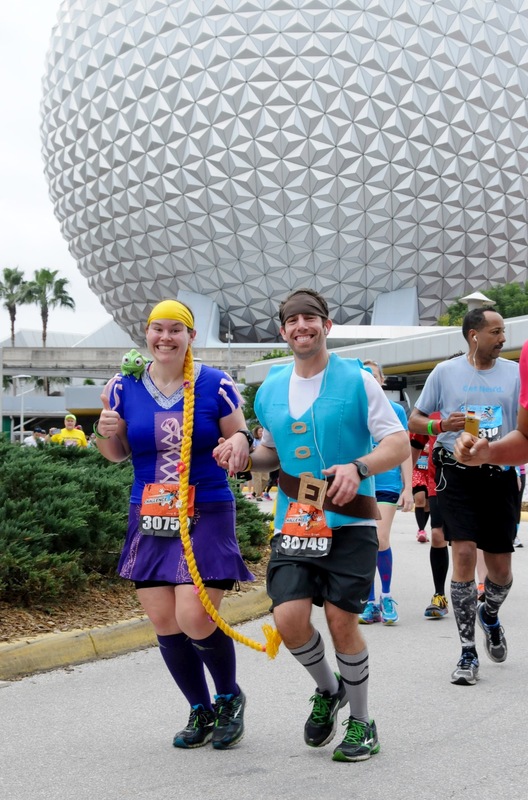 But we were sooooo close to the finish and we had been out on the course for sooooo long…I was anxious to get to Epcot and cross that finish line! We were able to run/walk/hobble/whatever you want to call it to the Boardwalk, with a few extra walk breaks. I knew for sure that he was struggling then because I heard a few expletives slip out of his mouth. And let’s just say that I’m the one with the potty mouth in this relationship, lol. I knew we were going to make it, and I tried to be as encouraging as possible. I think he was kind of annoyed at the situation because I was bouncing around and making jokes and smiling and acting like an idiot and giving high-fives to people…and here he was in pure agony. Seriously…I will say it again. 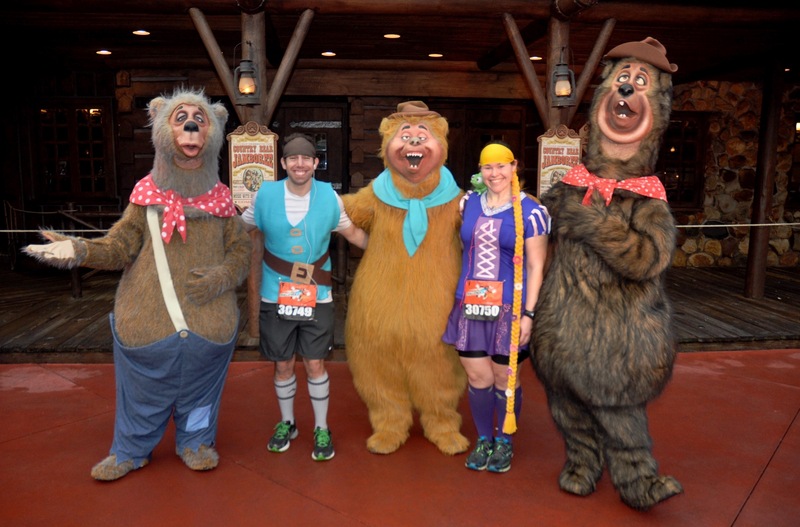 There is NO SUCH THING AS PAIN when I’m running in Disney. I’m sure I was just as tired and in as much physical discomfort as he was, but I just don’t *FEEL* it the way I do when I’m running any other race. Why do you all think I’m so obsessed with this marathon?! The views on the Boardwalk were beautiful as always, and with less than a 5K to go, I was feeling PUMPED. At long last, we made it to Epcot for what is seriously the MOST INCREDIBLE marathon finish you will ever experience. Magic Kingdom is obviously the best part of this race for me, but the lap around the World Showcase is a close second. Between the spectators cheering you on and the absolutely EPIC music you hear playing in each country, there is NOTHING like it. Oh, and the fact that there are a bunch of characters and absolutely no lines because we’re the only idiots who stop for photos in the last 2 miles of a marathon, lol. 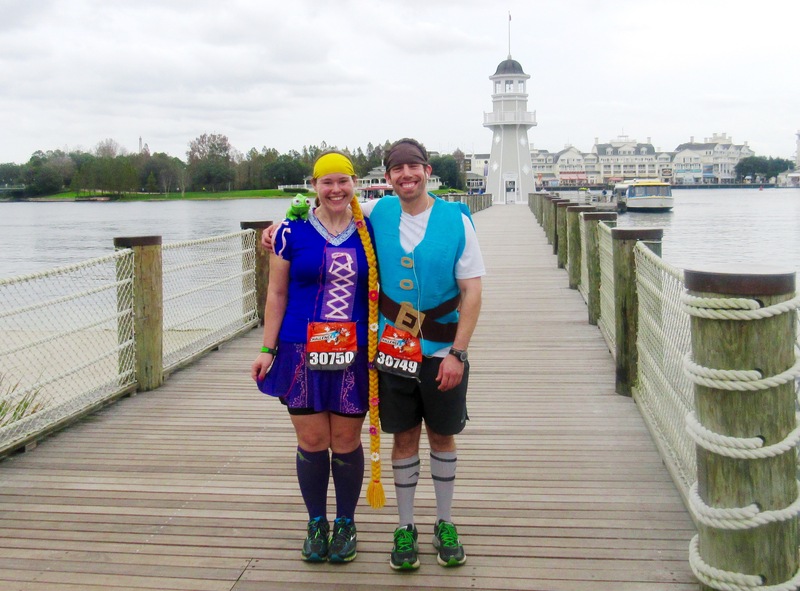 As we ran towards Future World, I could feel my emotions bubbling up…and I almost lost it. Here I was running the race that started it all. 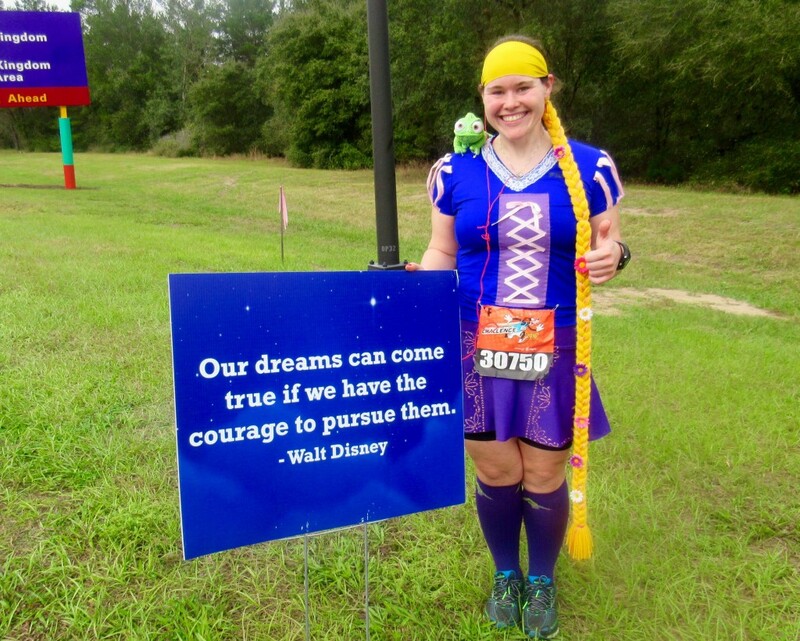 It sounds corny but running the Dopey Challenge in 2014 as my first marathon really did change my life forever. Not the least of which is that it gave me courage and a level of confidence that I never had before…and it made me realize that I could accomplish absolutely ANYTHING. 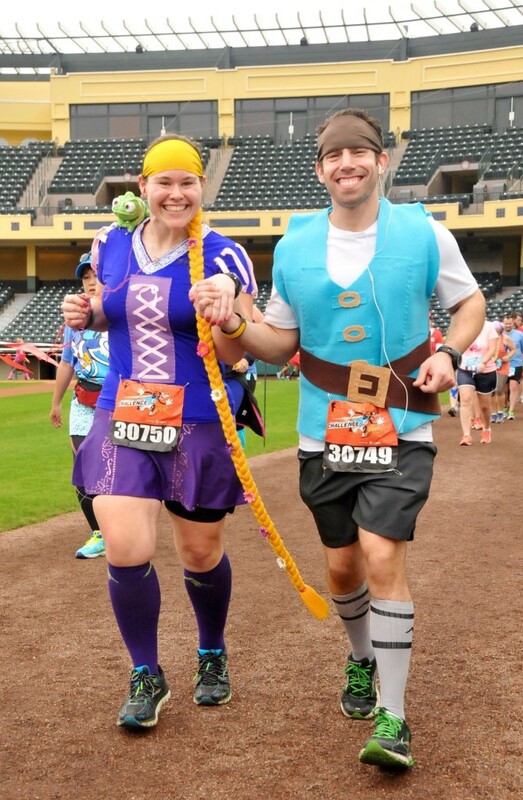 And I kept thinking about how Todd had told me so many times “I’ll never be able to do the Goofy or Dopey” because he legitimately thought he wouldn’t be able to finish. And here he was about to complete his first Goofy Challenge. 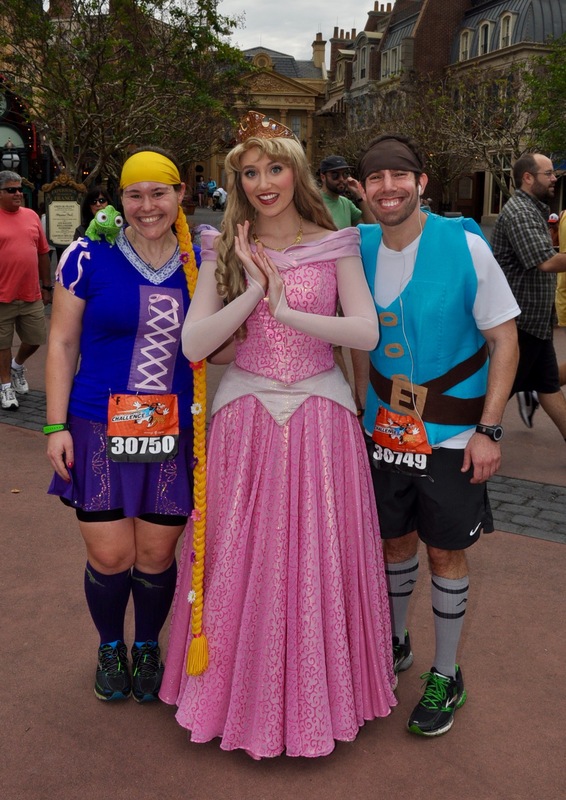 Everyone was cheering for “Rapunzel and Flynn!! !” and I was soaking up every second of it as we made our way towards the finish. And, ladies and gentlemen, after more than 7 hours and 15 minutes on the course…WE FINALLY MADE IT to the finish line. 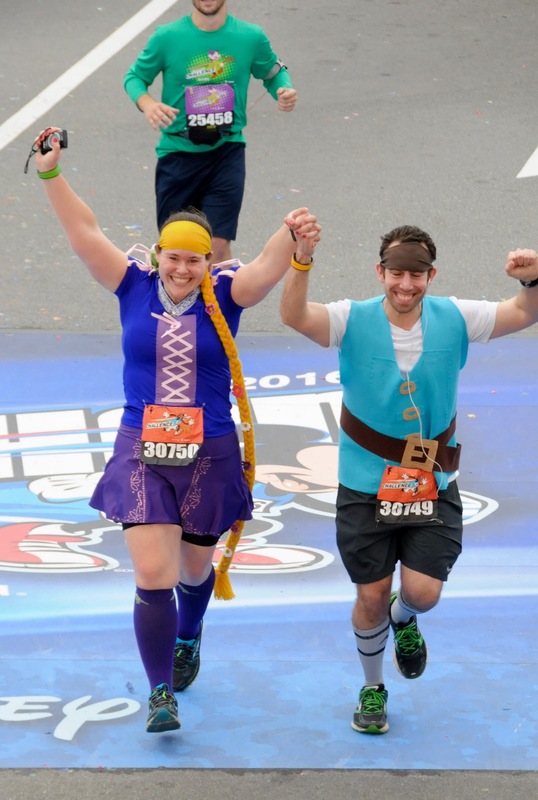 It was our absolute worst marathon time to date, but I didn’t care one bit. I enjoyed every second of it and I wasn’t the least bit sorry for all of the photos and characters and silliness along the way. 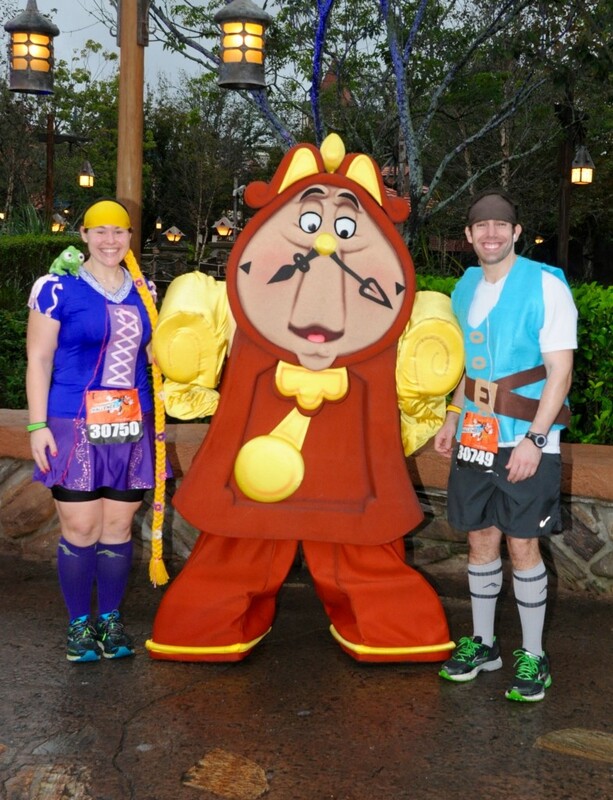 I’m not sure if I’m ever going to get Todd to agree to run the Goofy Challenge again. 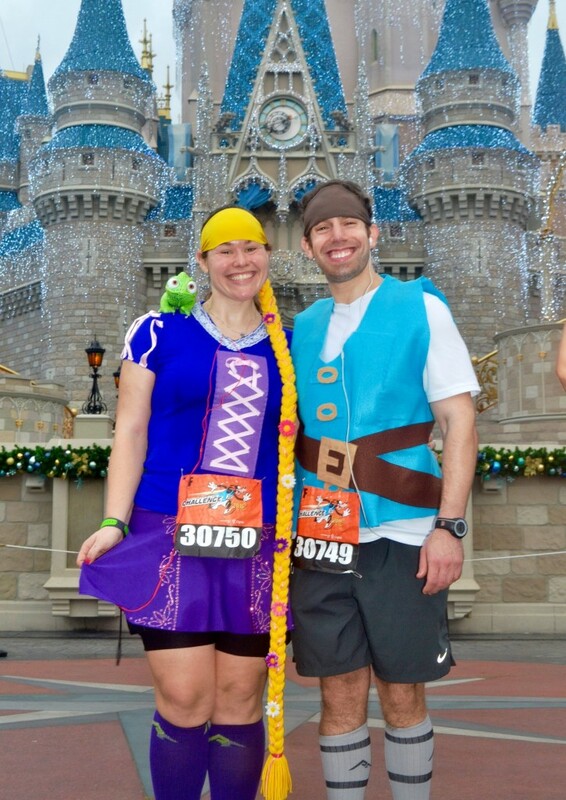 And he pretty much laughs in my face whenever I mention the idea of running Dopey together someday. But I could not have been more proud of this guy for completing his first Goofy Challenge. 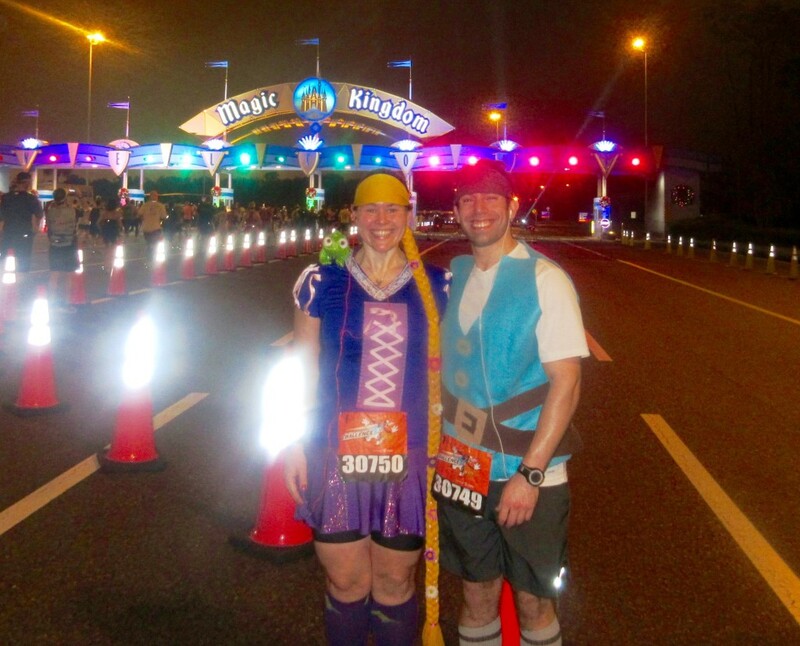 After some much-deserved chair time in the finish line area (um, and also, devouring those Oreos in the snack boxes…OMG I LOVE OREOS), we made our way…slooooowly…back to the car to hop to Magic Kingdom. Because, yeah…obviously this had to happen, lol. After a Shower Pill “bath” and a fresh change of clothes, we headed to Liberty Tree Tavern to stuff our faces and enjoy the rest of the night in Magic Kingdom. 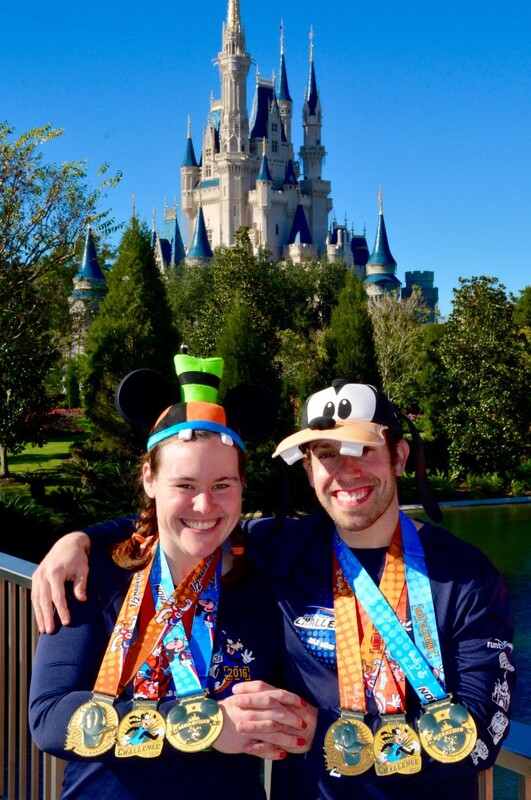 I know ya’ll probably think we’re gross (and also a little insane), but since it takes us so long to finish the race, if we went back to the hotel for showers, etc., the parks would practically be closing by the time we got back. And ain’t nobody got time for that. 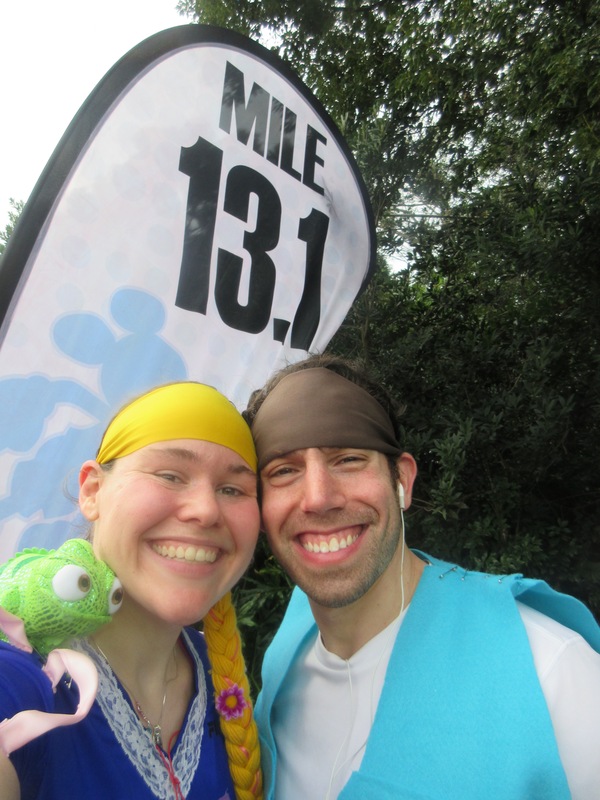 So, for the record, after the race was over some clouds rolled in and temperatures dropped and suddenly we were both FREEZING. UGH — it couldn’t have been that chilly during the race?! So, anyway, this happened. Thank goodness for Snuggies. Anyways, this recap has probably gone on long enough…so thanks for sticking with me, and, as always, for all of your support along the way! 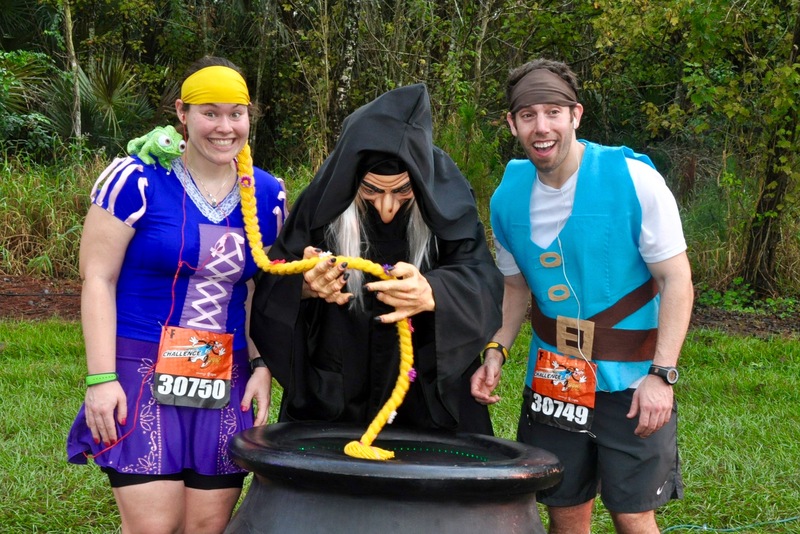 Have you ever been in danger of being “swept” from a race course? 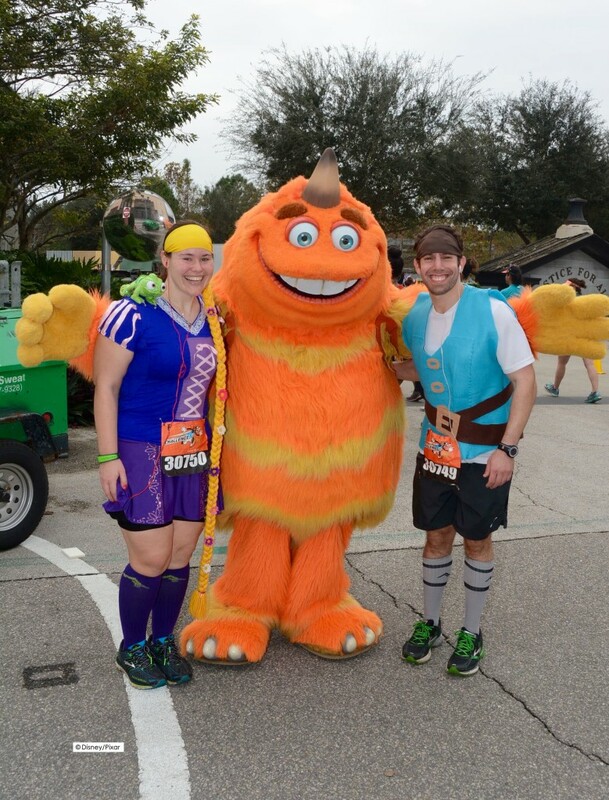 What’s your favorite part of the WDW Marathon/favorite Disney race? Hahaha, me too!!! It was a close call! lol. I know, right?! I’m sure no matter where you live we’ll keep running into each other. 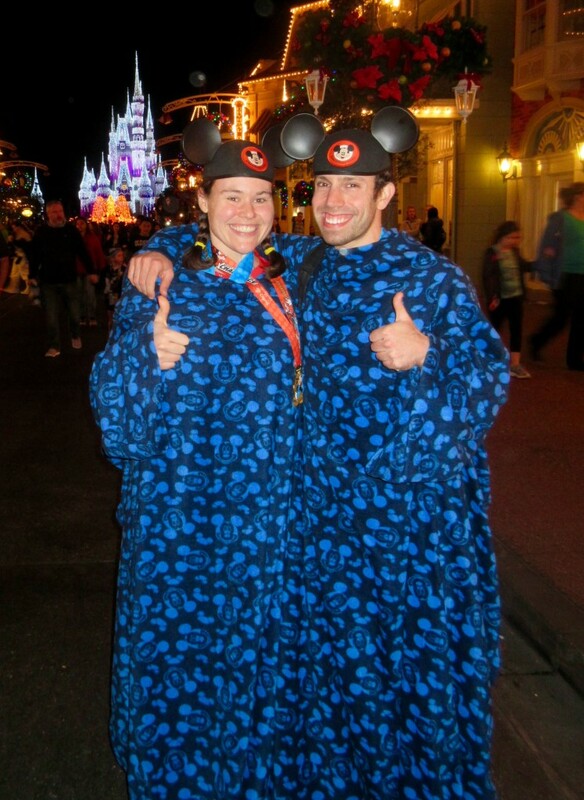 OMG those snuggies! Too cute! Reading this really makes me want to run the marathon again next year!!!! But I won’t cus I need to be more kind to my body…lol. It does have me excited for PHM next year though which I think will be a more manageable race for me. Tell Todd I felt the exact same way, my feet wear killing me and I didn’t even run the day before. 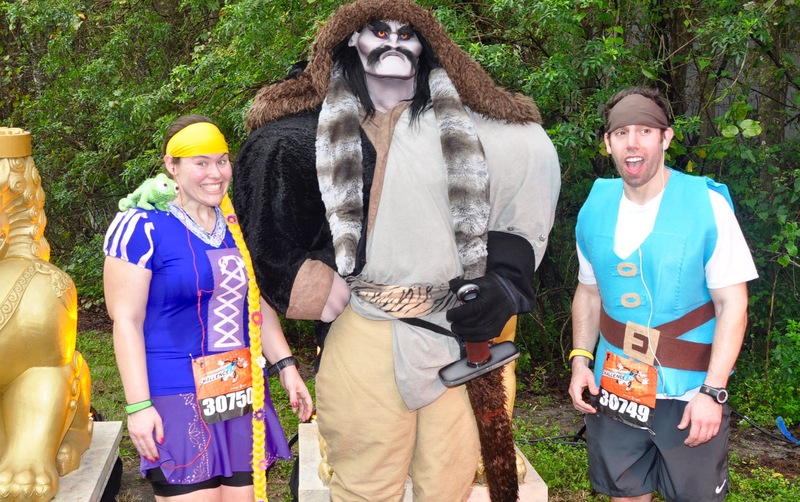 Many recaps I read mentioned more time running through MK but I must have been totally zoned out because I don’t remember much and I certainly don’t remember all those characters out on the course. You got some great pics and made awesome memories. Congrats to the both of you! Aww, thanks, Meranda! Appreciate it. The snuggies were a necessity…we did NOT plan for it to be so cold at night and we were dying, haha. Totally jealous you’re doing PHM! I feel like foot pain is part of the package when you’re in Disney because of all the extra walking in the parks, lol. 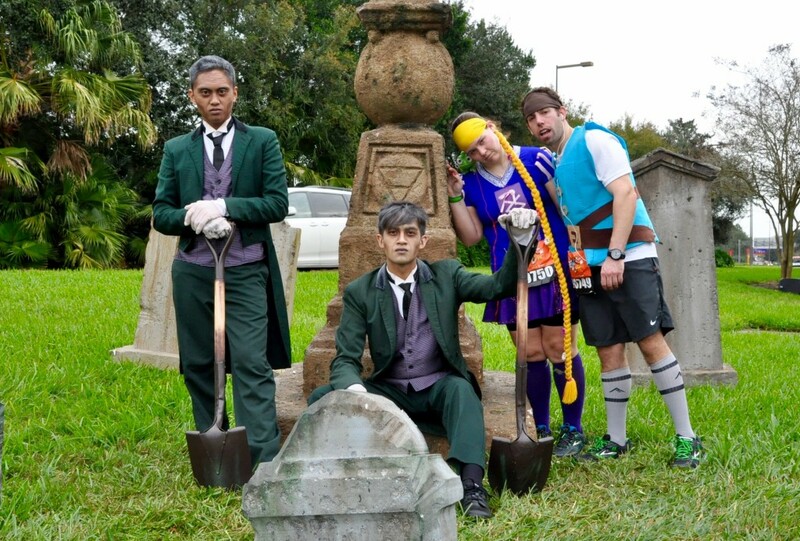 Your costume and pictures are amazing. 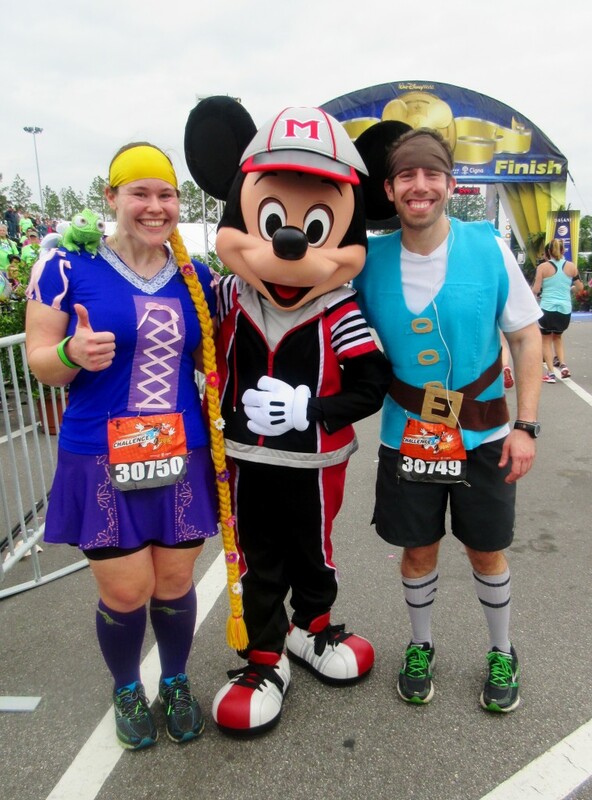 I’m hoping to tackle the Dopey Challenge next year and I hope it’s really as awesome as it seems! Thanks so much! 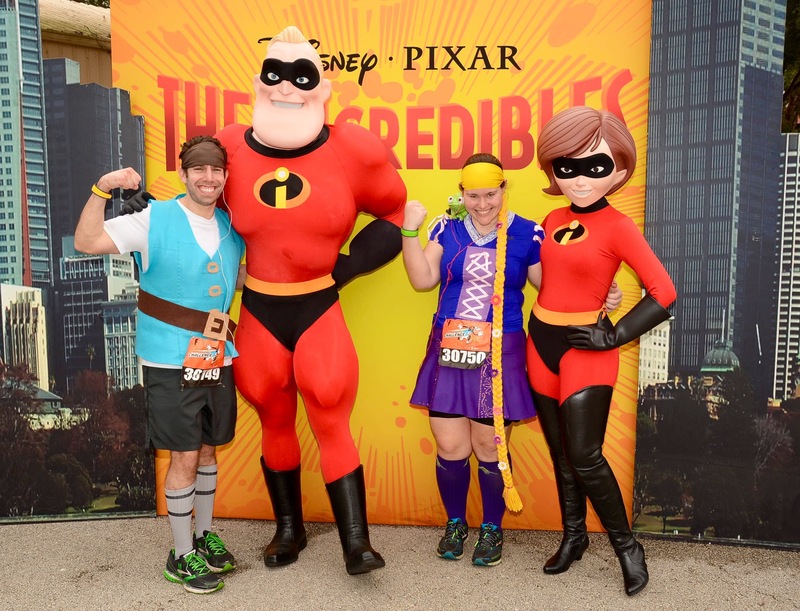 It really is awesome, and honestly, it’s the most fun you’ll ever have running a marathon. 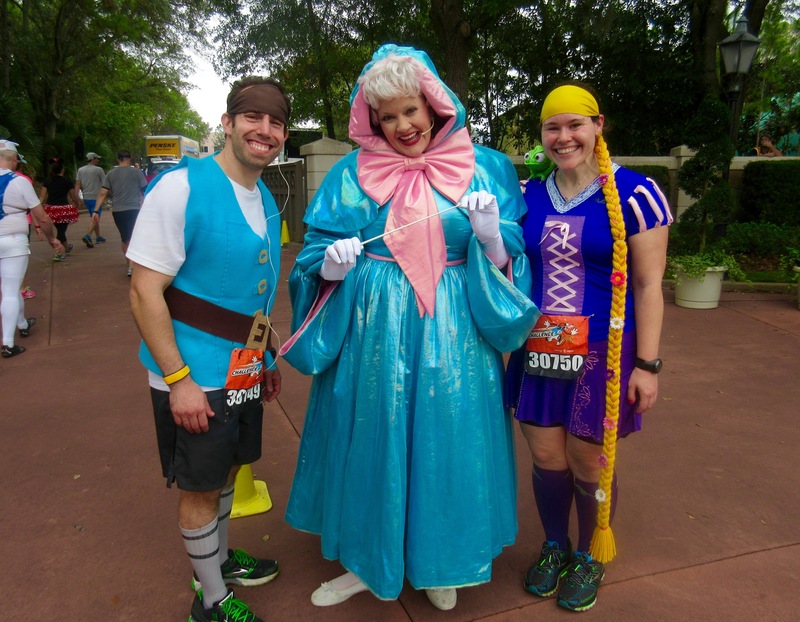 The Dopey Challenge is an AMAZING experience…it’s exhausting, don’t get me wrong, but it’s something you’ll never forget! I’d do it again in a heartbeat. 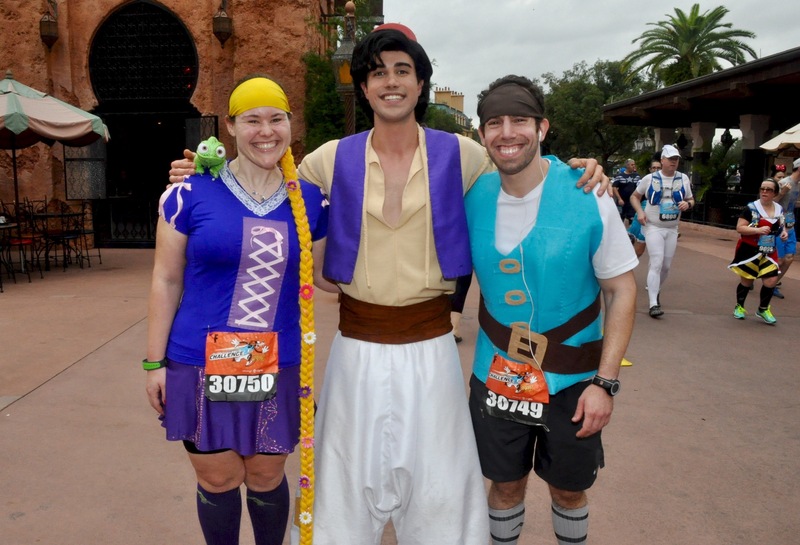 ugh all of your recaps makes me want to do ALL of the disney races. i don’t know if i’d ever be able to finish a dopey challenge without injuring myself, but i definitely hope to finish the marathon and half marathon one day! Hahaha, trust me, I wish I could #runalltheraces, too. 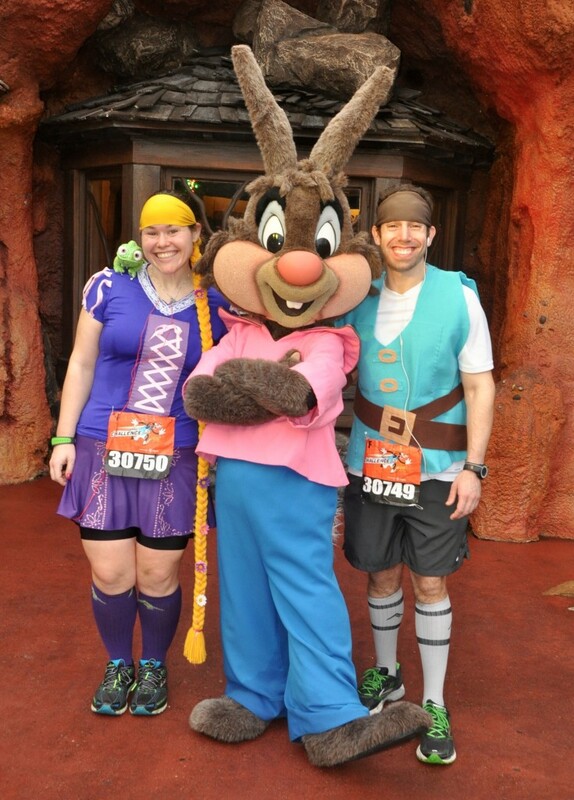 And if I can do Goofy/Dopey, anyone can do it! Great job! I think the most important thing for Goofy is finishing the races. don’t worry about time. 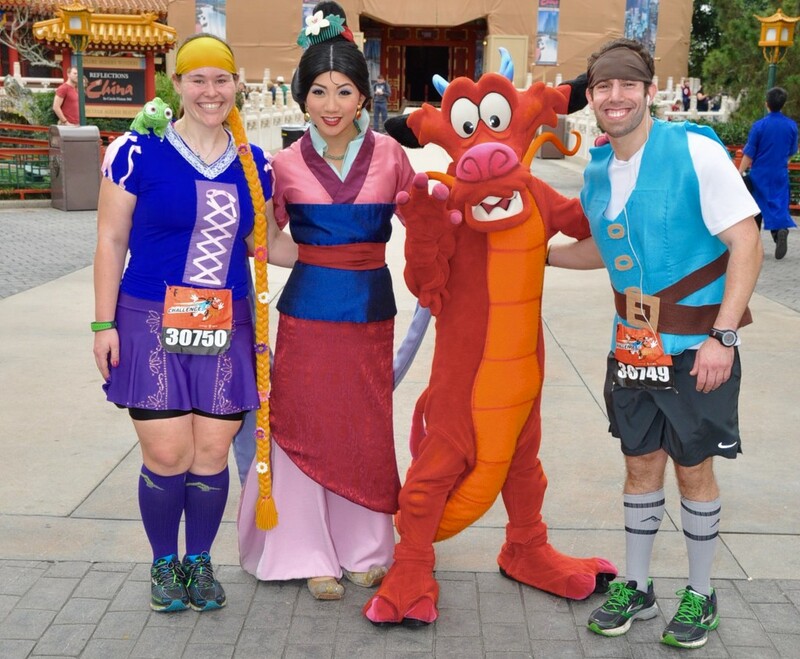 The parks are the reason for Disney races. Thanks, Lesley! I could NOT agree more! Wow, so glad that you avoided being swept by the balloon ladies! You guys clearly had fun with all of those character stops and even if it was your slowest marathon ever I’m venturing to guess it was your most fun one?!? YES, you can DEFINITELY say that! 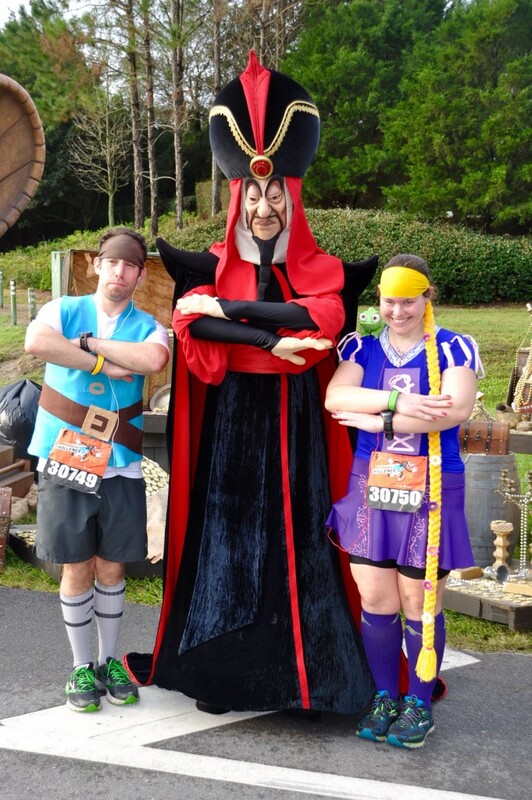 Great race re-cap! 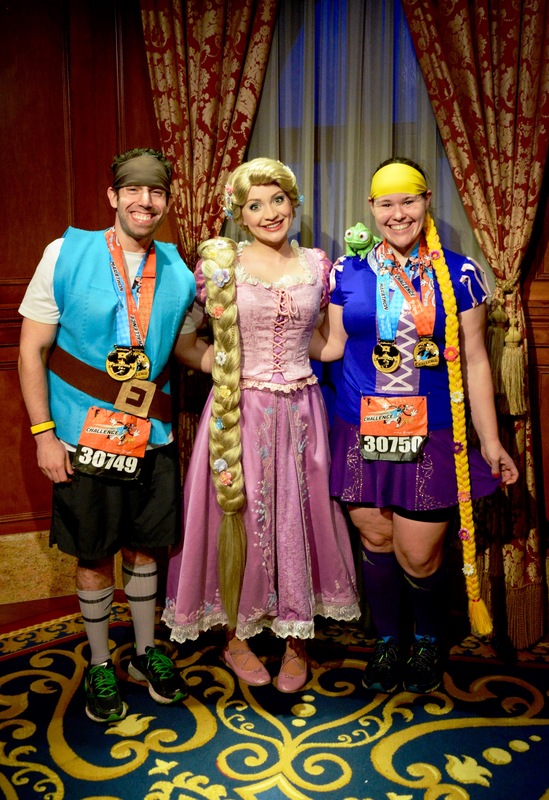 I did the WDW marathon this year and agree, the magic kingdom was the best part! Although the choir at the Epcot exit was pretty miraculous. I’m definitely wishing I had stopped for more pictures, you have some great ones. This was my first marathon so I was scared I would lose momentum if I made stops but I suspect it would have made the run more special. Thanks, Aimee! Congratulations on your first marathon, that’s amazing! 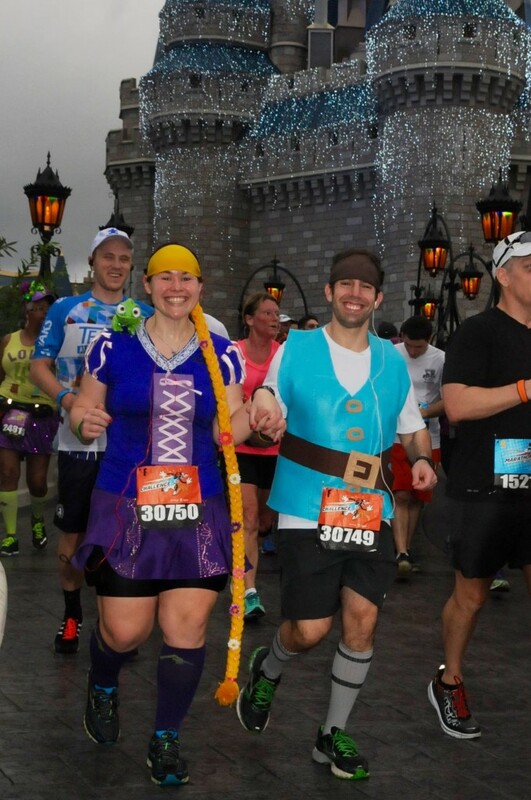 WDW is the best choice for a first marathon, IMHO. Sometimes it is tough to get going again after stopping, especially since we end up standing in some of these lines for character photos for several minutes. I guess you’ll just have to run it again someday??? LOVE LOVE LOVE LOVE this recap X1000! 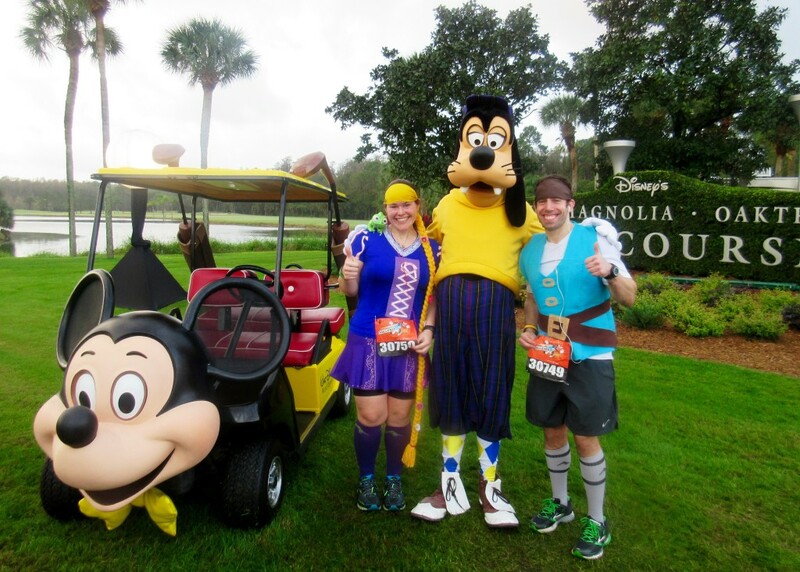 I am SO pumped to do Goofy next year. and the characters look SO epic compared to years past. and I was going to ask you how you kept pascal on (as I have the same costume for princess in a bit over 2 weeks!) so I will try it with safety pins! Thanks so much, Juliana! The characters were AWESOME this year, I was really surprised by how many “rare” characters were out! Oooh, yay! Honestly I didn’t even feel Pascal! A safety pin through each foot and he didn’t budge. The hair was a bit more cumbersome, as I’m sure you can imagine, lol. 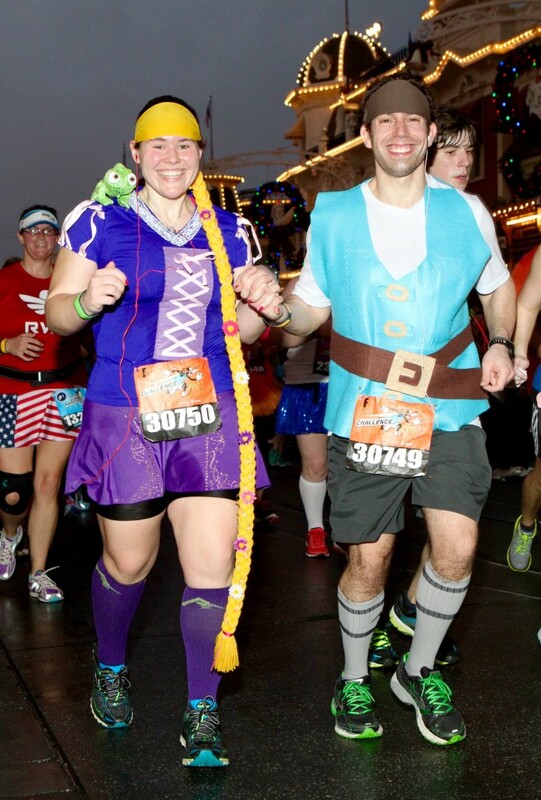 I actually saw you taking the photo on the sidewalk of Main Street during the race. I was going to say hi but my runner’s brain could not remember your first name. I felt silly calling you “final forty” so I just ran by. Congrats! Aww, you DEFINITELY could have done that — would have loved to meet you! I’ve been called “Final Forty” lots of times, LOL…I don’t mind at all. Hope to catch up with you at a race sometime! So, it’s time for me to run the Marathon again, definitely. 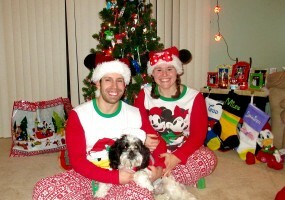 I loved all of the characters in your pictures and the extra time in MK! That’s amazing! Great recap, awesome job to you guys, and congratulations!! Thanks so much, Karen! 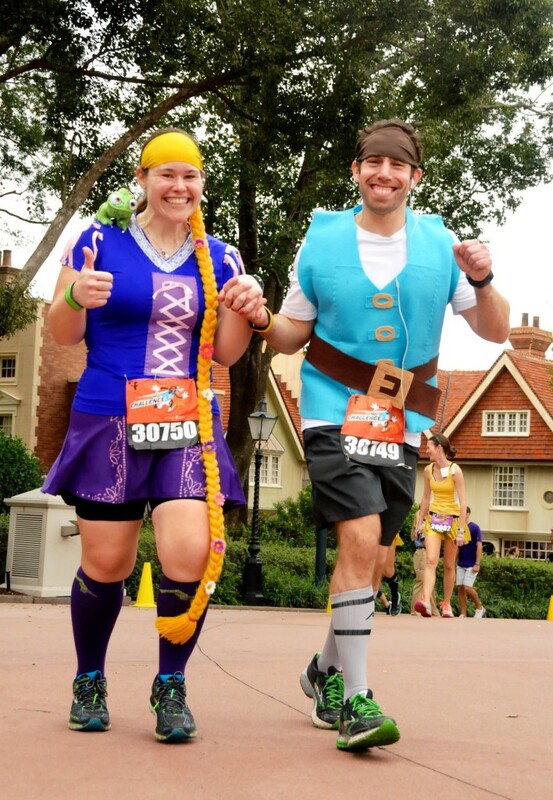 Is there anything more fun than the WDW Marathon…?! Oh em gee. You two are ridiculously cute. I love your pictures and your outfits. This recap is totally motivating me for next you. LOL, no worries, I knew what you meant! Haha, aww, thanks! 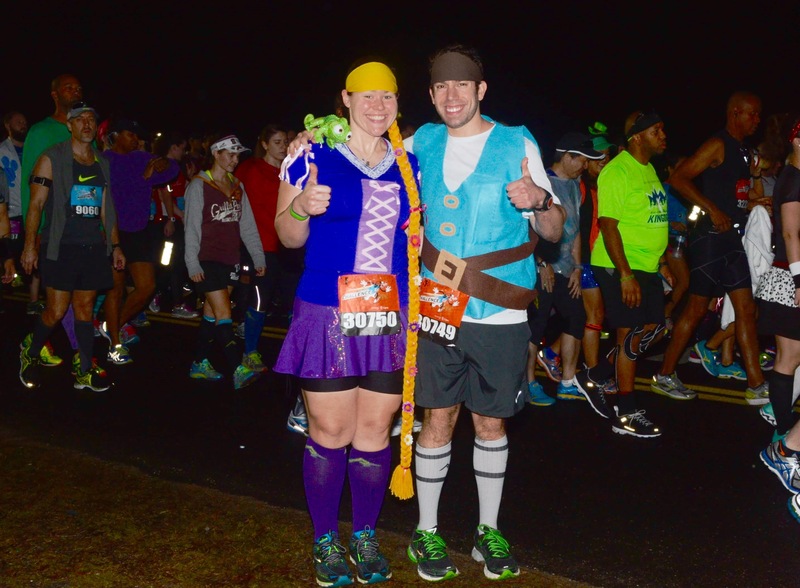 Hope to meet you at WDW Marathon 2017! 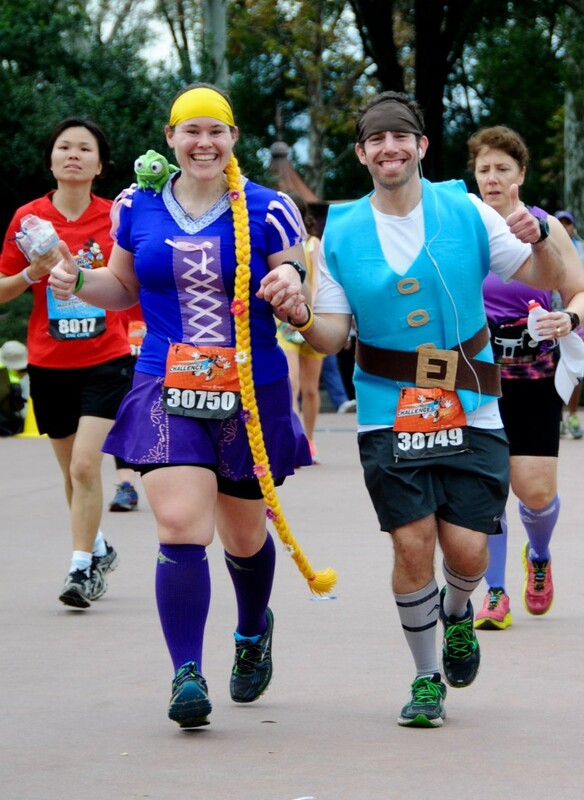 Someday, I hope to learn how to have that much fun at a marathon. Wow. 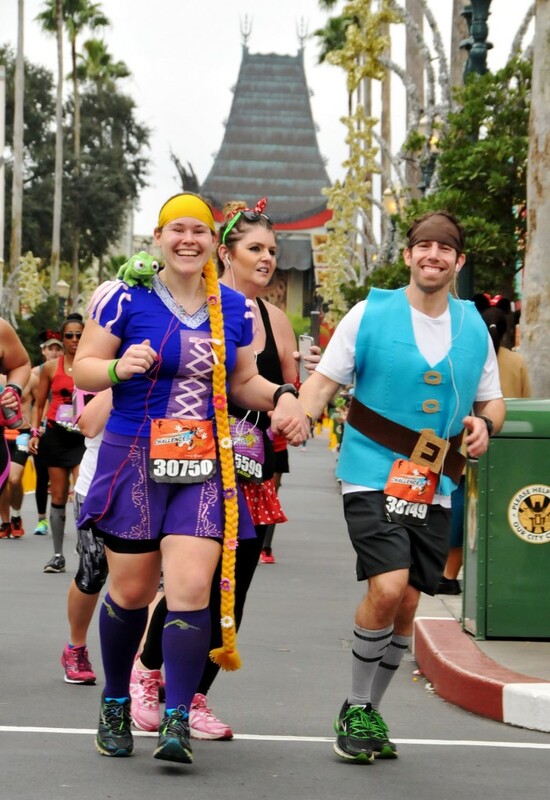 Hahaha, honestly, this is the ONLY marathon where I genuinely “have fun” the entire way, no joke, lol. Stop it! You guys are THE cutest. The snuggles???? I can’t even. Love it. Also love all the villain pics. So many good ones I’ve never seen on course. 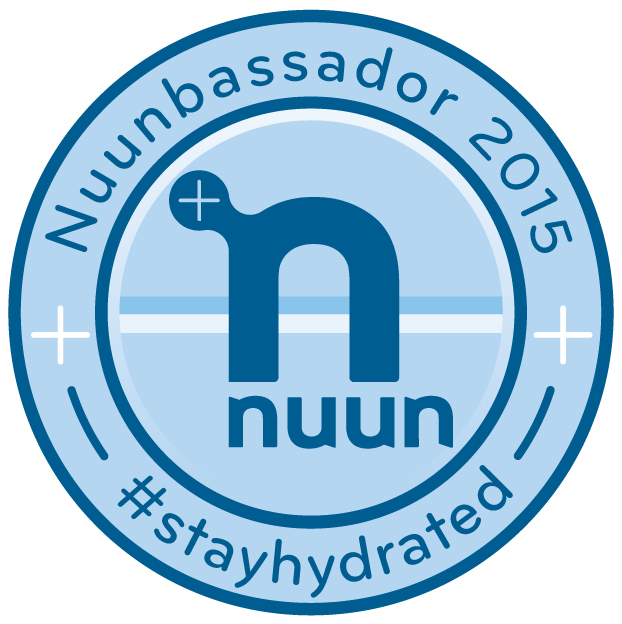 Congrats and thanks for sharing your adventure. Put a huge smile on my face reading. It sounds like your experience was very similar to ours. 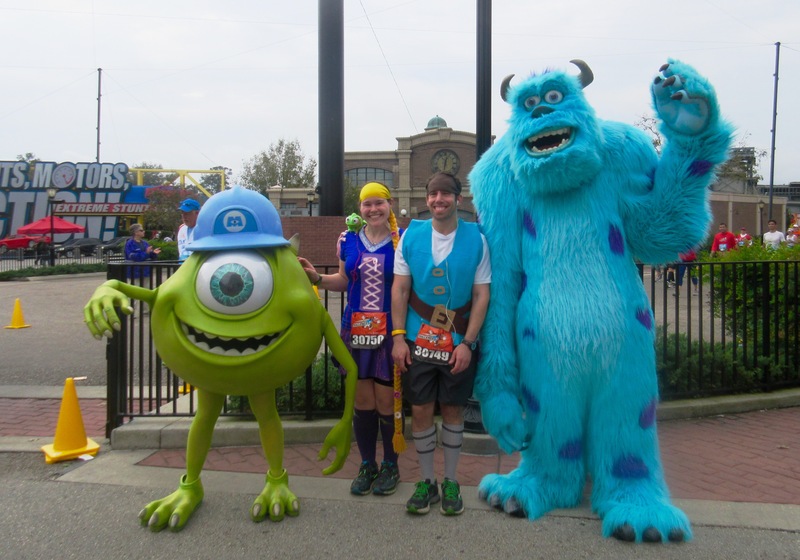 It was Phil’s first marathon which he did absolutely no training for, so it was a lot of me encouraging hm that he could finish. I was so scared of getting swept too. I think they were about a mile and a half behind us at one time. Nothing more motivating than that! 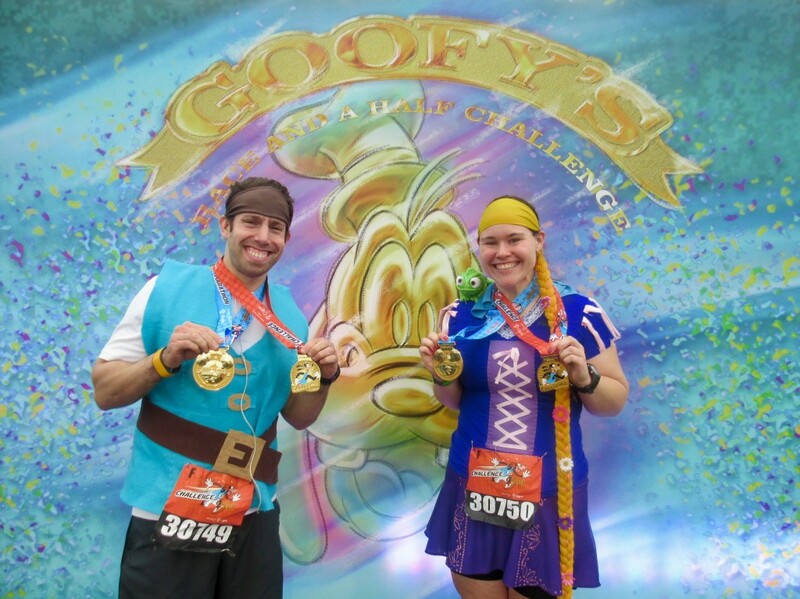 haha Awesome job to both of you for completing the Goofy! 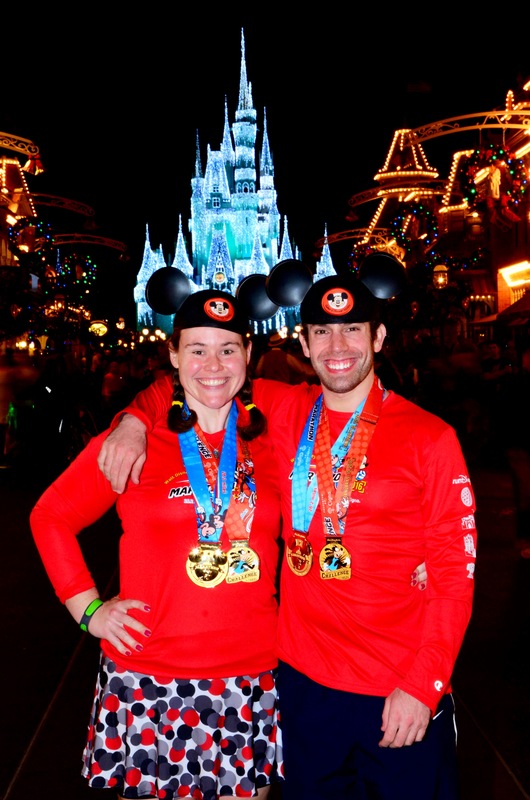 I just stumbled upon your blog…im a huge RunDisney lover too! 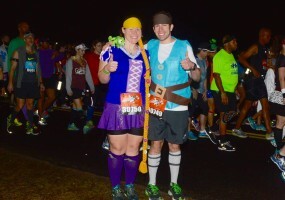 I enjoyed your recap…I didn’t run the full this past year but did Dopey in 2015…glad they filled up the boring stretch between Magic Kingdom and Animal Kingdom! Loved your pics! 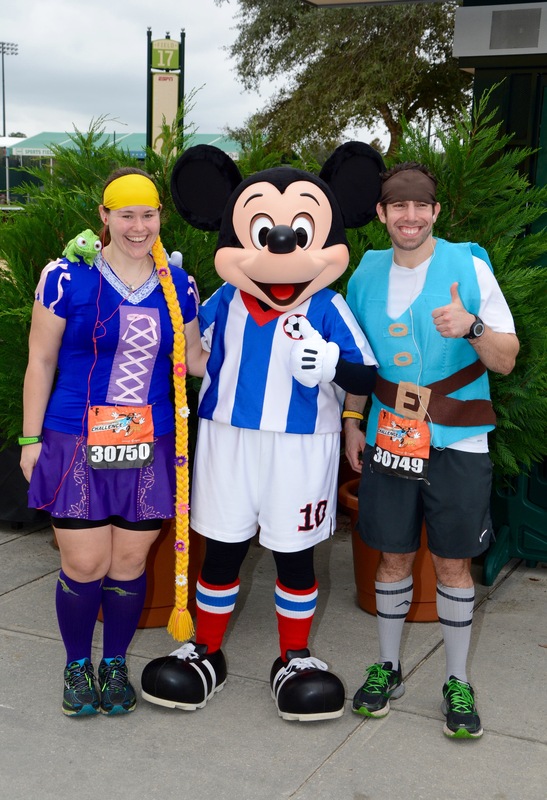 I’ll be there for the WDW Marathon 2017!